The Statue of Liberty is located in the port city of New York, in the United States. 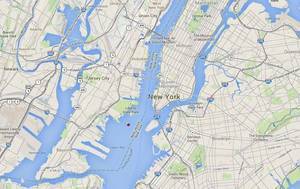 To be a little more exact, it is on an island, formerly known as Bedloe's island and now named Liberty Island (Who knows why ...), and half to 2Kms South Manhattan. Its exact GPS coordinates are 40 ° 41 '21.53' 'North and 74 ° 02' 41.29 '' West. If you have the Google Earth software, so click on this link or open it by double clicking on it, once downloaded: He will tell you the exact location of the Statue of Liberty: Google Earth link. 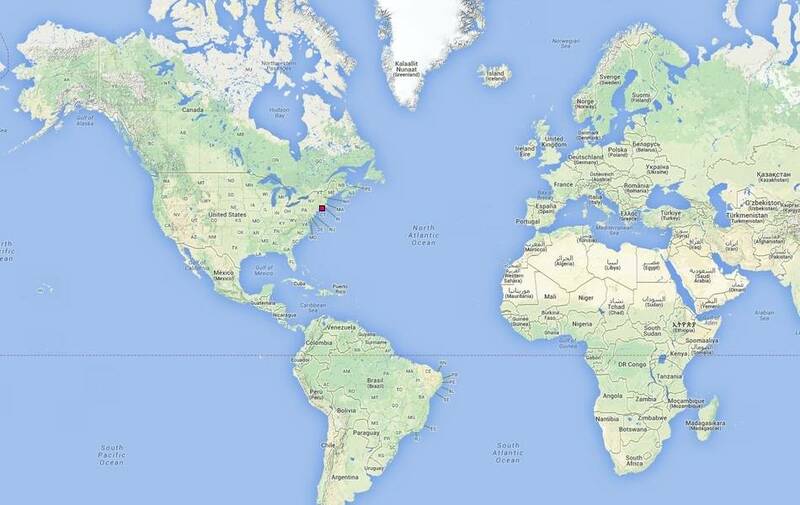 From a general point of view the Statue of Liberty is on the North American continent, on the East Coast. Go down to see a little more closely. The Statue of Liberty is located on the east coast of the United States. 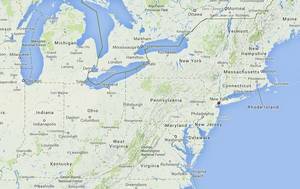 The Northeast region of the United States shows more precisely the location of the Statue of Liberty. The Northeast region of the United States shows more precisely the location of the Statue of Liberty. Chesapeake Bay is distinque but not that of New York, much smaller. Away from the New York area View. Distant view of the New York area. 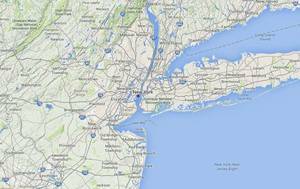 It segregates Long Island and the bay, and the Hudson River, which descends from the north. The New York bay, with Manhattan and the port city. General view of New York Bay and its harbor. It segregates Manhattan and its straight avenues. 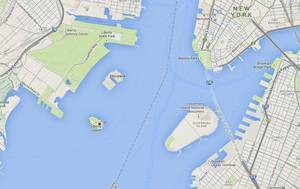 The New York Bay and the position of Liberty Island. Detail view of Liberty Island in New York Bay. The New York Bay is still well protected from the elements. The waters are calm relativements, which is why we have used such a low island to build there first a military fort, then the base of the statue. The island has only 2 meters, and again, this is an average, in the West it is very close to a small meter. It is relatively rare that visiting boats can not land because of bad weather. As for the facilities themselves, they hardly risk anything, blows winds are not strong enough to worry the authorities. Exceptions exist, such as the day when the hurricane swept New York, but even there the damage were not very important. The island is not far from the banks of the Hudson, but do not think to go swimming. Closer ago Liberty State Park, facing west. In a straight line, there is 610m away to reach the side of Marris Pesin Drive. 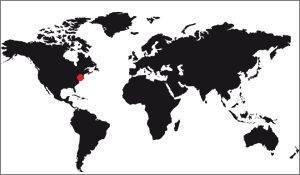 To the north, the first earth is Ellis Island, where the famous island landed immigrants. It has 700m. 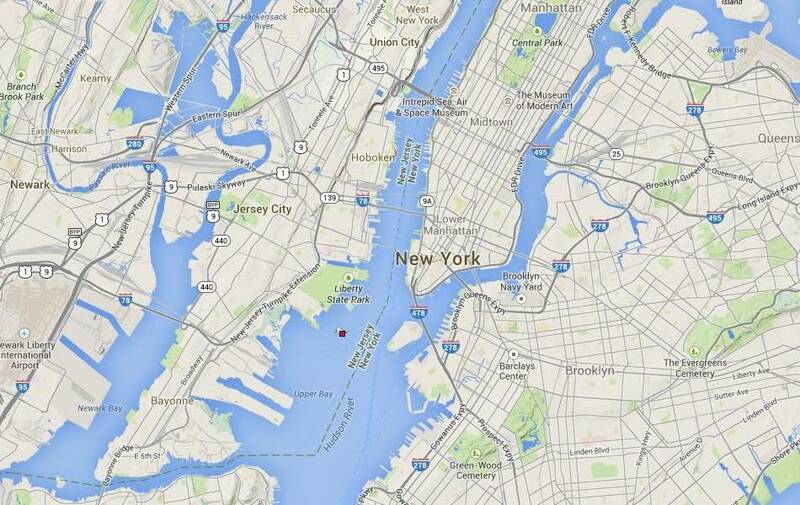 Farthest, 1.5 Kms due east, you would arrive at Governors Island, another island just before Brooklyn. Finally, to get to Manhattan, the faster you have to take the North-east on 2Kms and 670m to get to the nearest point: Battery Park. 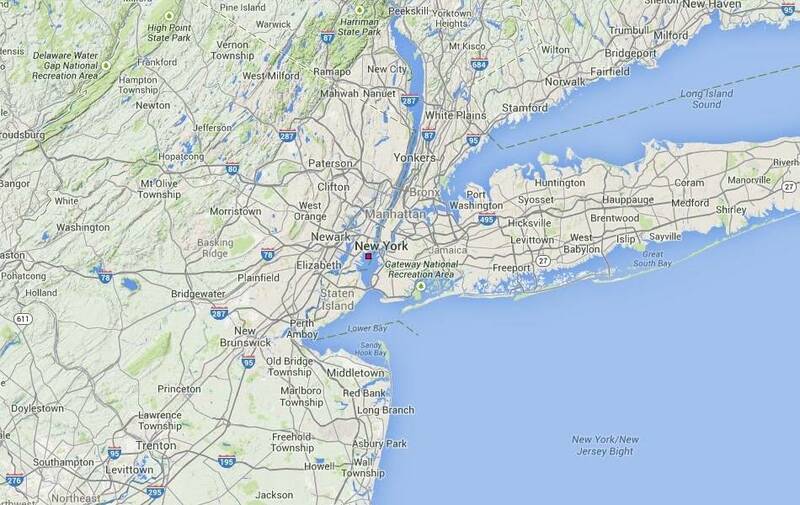 Other possible points of arrival are more remote: Brooklyn, southeast, is 2.3 Kms and New Jersey is 2,750m southwest. As long as one is in the distance, know that the Statue of Liberty is a 5 852Kms and 450m from its Parisian replica! The Statue of Liberty is on Bedloe's Island, renamed Liberty Island since its construction. This is an island of New York Bay on which was built in the nineteenth century a small military fort. Why did you chose as the site of implantation of the statue? In fact, as soon as the decision to build a gigantic statue was taken, Auguste Bartholdi, the sculptor, visited the United States to look for a site of implantation (1871 first of four trips that it will make the United States as part of the construction of the statue. He met the American authorities, to President Grant, and members of the French-American friendship association in New York and Philadelphia . He took advantage of this trip to build links between the two countries and ensure the presence of a set of trusted people to make the bridge between him and US officials. On this trip he search the site of implantation. He knew he had the implant in New York, but the exact location was yet to be defined. He was interested in Battery Park, a large green park just south of Manhattan, but could not bring himself to select because of the horizon blocked by skyscrapers. Getting here, her statue would have been crushed, visually speaking. Another solution would have been to put the statue in Central Park. In this large park emerged in the city center, the statue would have been a beautiful location, but again the skyscrapers would have made it smaller than it actually is. And Bartholdi sought a location that would be dedicated to him, like a memorial, and the two following locations already served on. It is testing the location of Battery Park he had the right idea. 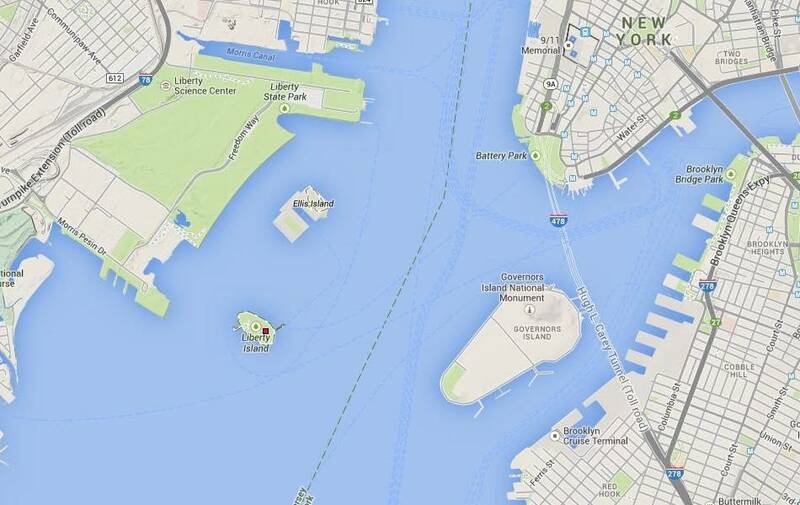 Indeed, to see if the statue would have good visibility in Battery Park, you have to get to New York by boat. But the port was intense activity area, much larger than today, because it is a large part of the cargo and passengers arriving at the new world that passed through the port of New York, and there there was a small virgin island except a strong Bedloe's island: The island was really the place it appeared to meet the needs expressed by Bartholdi. She had the advantage of being in New York, which was decided upstream, and in the bay that is visible to all boats entering the harbor. However, at the time of the construction of the statue, all travel between the two countries was by boat, and New York was a major point of entry for the United States. Here, it would be sunny. "Here, I feel the spirit of the place. This is where men see the New World for the first time, it is here that my statue will stand up for freedom disseminate its rays on the Old and New World." Another advantage is that it is not directly facing the Ocean, because in this case the weather could undermine rather easily. There remained a problem: the presence of the military fort. But it was only a false problem, since the latter had already been downgraded, it was only a shell. Bartholdiimmediately understood the value of her presence: Instead of being an inconvenience to destroy, he would serve as the basis for the base. This was only a proposal, then the base of the statue was the responsibility of the US, but the idea seemed sensible. The choice of this island seemed so obvious, and that on the first visit Bartholdi. This choice was not contested, and at no time the project is not thought to move. The final choice came to American Parliament, which gave its approval thereafter. Could she be installed in another city? No doubt it would have been possible, but the determination set by Edouard de Laboulaye, the designer of the statue and the sculptor Auguste Bartholdi to make it in New York was so great that he would have had a much greater pressure other cities to get it. 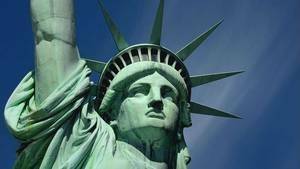 It must be said that New York was the main entry point of the United States, therefore all migrants would see the statue, and it was probably the most important advantage this city had compared to others. In the event that the people of New York were prepared to coolly ignore this beautiful memorial of the centennial of Liberty, they can be certain that Philadelphia would host the eagerly in the beautiful gardens of Fairmont and erect in all its grandeur original. We can offer a site worthy of the ideal it symbolizes. The Golden Gate, so majestic where we look, is a natural and appropriate site for the statue. However the statue was built in New York, as expected. But in 1882 there were serious contact to be erected in Boston. The councilors of the city had sent a delegation which negotiated a time to recover the implantation site. The idea to change the situation of the statue is not so incongruous than that, it could have happened.